Title: 'Les Isles Philippines Molucques et de la Sonde'. 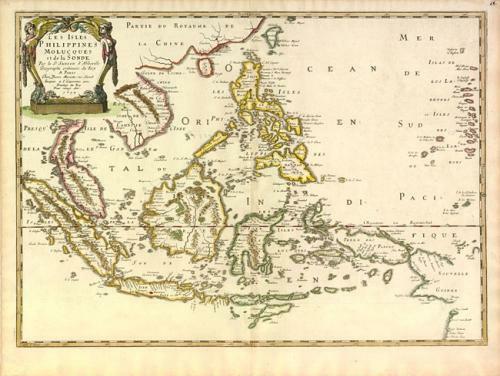 A lovely example of Sanson's map of the Philippines, Malaysia and the East Indies. While French cartography of South East Asia primarily followed standard Dutch models, the map is presented in Sanson's handsome style with restrained embellishment. It extends to show the Mariana Islands, Islas de los Ladrones and a sketchy New Guinea that includes the Dutch discoveries in the region. Beautifully engraved by J. Somer with a title cartouche formed by the wings of two mythical harpies. Near fine with just a hint of centerfold toning.